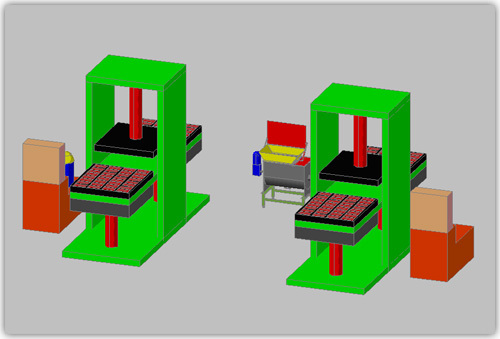 Brevet machine de recyclage TIRES U.S.A. Although the incentive to the building of used tyres recycling plants represents a very good business chance, the same is the possibility to can satisfy an ecological use of the recycled product. TIRES S.p.A. besides to innovate its recovery lines, studies and acts next to engineering studies for applications in the urban use, thanks to elastomeric property of the recycled rubber granules and powders. The company has put right a simple system of cool pressing from which you obtain anti-shock floors, which get a very good and fast remuneration on the market. The plant allows to stamp ecological tiles composed of rubber mixes coming from the recovery of used tyres, and ties with polyurethane resin. They are produced with the using of pressing technique and processed to colouring through the using of several types of coloured pigments. Anti-shock floors produced by our plant design, can be certified for the critical height of fall (HIC) on the several thickness of realizing, according to the law EN 1177. 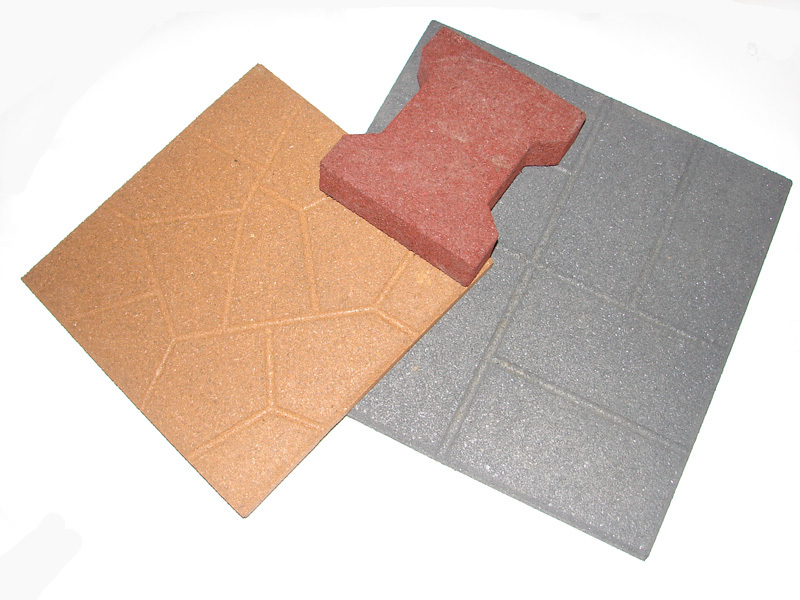 Applications: Recycled rubber anti-shock floors was opportunely studied for applications in the urban furnishings to eliminate the danger in the areas where usually one runs, one jumps, one plays, like playgrounds, terraces, pool, bicycle path, etc. The principal characteristic is to eliminate the danger of slithering and to cushion the fall shock. Moreover, it has been created and projected to resist to the atmospheric agents and to the wear, with some characteristics that favour the water drainage. UNI EN 1177 Coverings of surfaces with impact absorption. Such a law is the official Italian version of European EN 1177 approved by (CEN) European Committee for Standardization, on August 1997. It sets the least requirements for any type of investment of play surface for children, in order to cushion the fall impact. During the playing, children can suffer wound for accidental causes. Injuries to the head represent the most critical conditions, so CEN drew a law which classify absorber materials to use like covering in the play surfaces, in order to decrease the probabilities of injuries to the head. The law UNI EN 1177 so, orders the factors to have in respect in the choice of the type of the floor for playgrounds and it gives a test case to set the damping impact. The final result of a such test specify the minimum falling height for every single type of covering, indicating the maximum efficacy limit in the decreasing of the possible injuries coming from falling, during the normal use of the plays complying with the rule UNI EN 1176.